This eye model illustrates the microscopic anatomical structure of the retina with choroid and sclera. 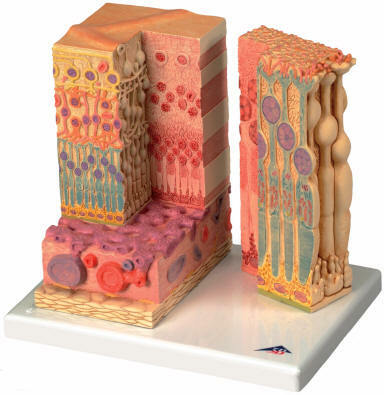 The left block-like, layered side of the eye model shows the complete structure of the retina including the supplying vascular layer and parts of the sclera from a light microscopic view. The right part of the eye model is a sectional enlargement. The Micro Anatomy Eye shows the microscopic structure of the photoreceptors and the cells of the pigmented layer. The left part is enlarged 850-times. The right part is enlarged 3800-times. You've never seen the human eye like this before! Students no longer have to rely on visualization — they’ll actually see how the human eye functions! Through a series of engaging hands-on, eyes-on experimental activities, your students will not only witness how the human visual organ functions, they will also recreate common visual disorders and discover how to correct them. The Rubin’s Eye Lab first demonstrates how crisp, inverted images are projected onto the retina during normal vision (emmetropia.) Next they’ll discover how the internal lens of the eye must adjust its focal length in order to bring near objects into sharp focus (accommodation.) They will go on to reproduce each of the following visual disorders: • Myopia (nearsightedness) • Hyperopia (farsightedness) • Presbyopia (age-related near-vision failure to accommodate) • Astigmatism (blurred or distorted vision at any distance due to irregular corneal curvature). For each disorder, your students will in turn have to implement appropriate corrective steps — reinforcing the learning experience as they do so. 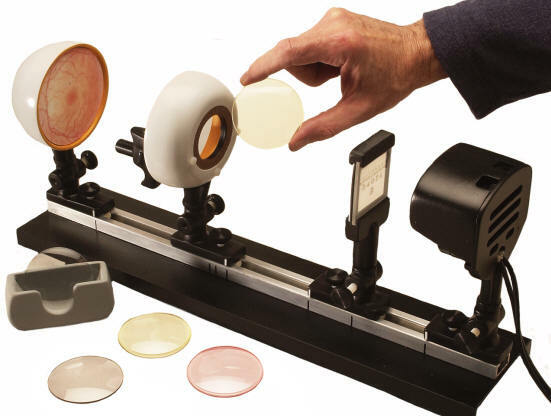 The self-contained Rubin’s Eye Lab package incorporates: • An optical bench with track and indicator markings for experimental repeatability. • Object slide holder. • Anterior eye hemisphere with integral corneal lens holder and patented trigger — focusable internal lens. • Posterior eye hemisphere with retina. • Long life halogen light source (20W, 115V, 50/60 Hz) • Four adjustable supports for positioning components on bench. • Set of five interchangeable color-coded corneal lenses made of impact-resistant optical plastic: (1) plano lens (clear) (2) concave lens (pink) (3) convex lens (gray) (4 & 5) two astigmatic (toric) lenses (yellow) • Handy lens caddy for stowing corneal lenses. • Step-by-step illustrated instructional guide to experiments and additional suggested activities.